:Too often, all our contemporary culture sees in Genesis 1 and 2 are problems involving Darwin, dinosaurs, and the length of days, while the Trinity is dismissed as irrational or a later imposition on the Bible. But a loss of confidence in these doctrines would be a disaster for thinking Christians. In fact, these foundational, biblical truths of the Trinity and creation are among the richest sources of insights and tools for robust and sensitive engagement with contemporary culture.With diagrams and clear explanations both of the Bible and our contemporary world, Christopher Watkin reclaims the Trinity and creation from their cultural despisers and shows how these foundational doctrines speak into, question, and reorient some of the most important debates in today's society. 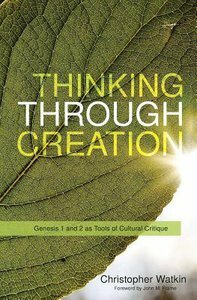 About "Thinking Through Creation: Genesis 1 and 2 as Tools of Cultural Critique"